Join us to chant every Saturday morning for our 20 minute Morning Mantras! Mantra is a powerful tool to connect with the energy of our hearts, boost our feel good vibes and inspires positive thinking. 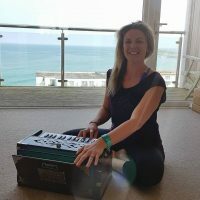 We chant 6 signature mantras with the beautiful sound of the harmonium to help us wake up and connect with our day. We sing in Sanskrit (the yogic language) through call and response so you can learn each mantra as you go and guided song sheets are provided. This class is complimentary and a great addition to your yoga class before or after. No singing experience is necessary! No need to book, just turn up but if you’re planning on coming along to our 7am SUNRISE FLOW or 8.30am ENERGISE or HOT YOGA, we recommend you book in advance for these.